User-defined targets are Image Targets that are created at runtime from camera frames selected by the user. They share most of the capabilities of a standard Image Target with the exception that they do not support Virtual Buttons. Just as Image Targets allow a developer to choose an image ahead of time that the app recognizes, User-Defined Targets allow an end user to pick an image at runtime. Thus, the user experiences AR “any time, anywhere” by selecting an image – like a photograph, book cover or poster – from his or her immediate environment without having to carry around pre-defined targets. User Defined Targets should be captured and viewed under moderately bright and diffuse lighting. The surfaces of the object should be evenly lit. Indoor scenarios generally work well. The process of capturing, building and tracking a User Defined Target is managed by your app logic using the Vuforia Engine API. Because the target image is selected by the user, it's important to communicate to the user what types of images can be used and how they should be captured to get the best user experience. In the application, the developer should communicate to the user the qualities of a good target so that the end user can select images that will support robust detection and tracking. The user should be instructed to capture the image when their device is parallel to the plane of the image's surface to minimize perspective distortion. This will provide a good rectilinear reference of the image to the ObjectTracker. The SDK also provides a frame analysis indicator that can be displayed to the user to indicate when they are viewing a suitable image to use as a User Defined Target. The User-Defined Targets sample app shows how to design user interface and user experience elements that will enable your app's users to execute a UDT experience effectively. 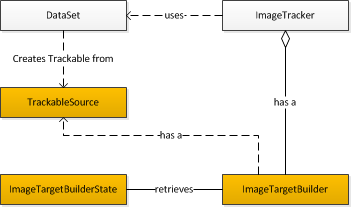 Since user-defined targets are created by invoking the target acquisition process using the ImageTargetBuilder at runtime, this article gives only a generic overview about this feature. The developer must provide instructions within the application for properly framing the snapshot. Note: Attributes for user-defined targets are not stored in the Database Configuration XML file. Start scanning automatically: If this is enabled, the target builder will automatically start to scan the camera image for feature points on startup. Stop tracker while scanning: Check this if you want to automatically stop the ImageTracker while the Target Builder is scanning. Once scanning mode is stopped, the ImageTracker will be automatically started again. Stop scanning after creating a target: If this is enabled, scanning will be automatically stopped when a new target has been created. If the last two options are disabled, it is possible to create an application where scanning mode is never left and targets are tracked immediately after creating them. With this configuration it is possible to create multiple targets in quick succession. See the UserDefinedTargets sample for details. A sample implementation of theIUserDefinedTargetEventHandler interface can be found in Assets/Scripts/UserDefinedTargetScripts/UserDefinedTargetEventHandler.cs. 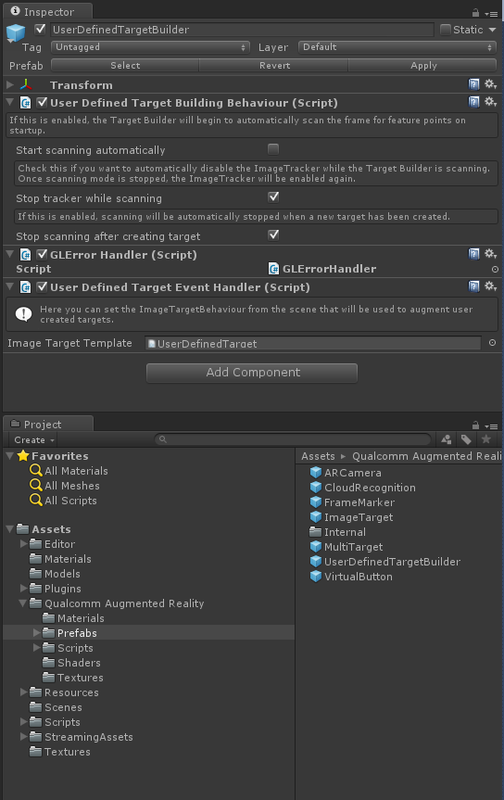 Instead of the UserDefinedTargetBuilder prefab, the ImageTargetBuilder API can be used directly. It can be found in Assets/Vuforia/Scripts/ImageTargetBuilder.cs. In this article, we show how to use the User-Defined Targets feature to instantiate objects of classes from TrackableSource which can be used to create new Trackables at runtime. The class ImageTargetBuilder exposes an API for controlling the building progress and retrieving a TrackableSource for instantiating a new trackable upon successful completion. Once build() is called, the developer polls for the TrackableSource to be available, which it can then use to instantiate a new Trackable in a DataSet. Here we show the call flows to enter the scan/build states for the UDT creation process, and then how to add the created trackable to the desired dataset. In this example, the tracker is stopped when we enter the scanning state, and then re-started when the process is complete. A limited number of targets is guaranteed to be available for detection and tracking instantly. These could be paid-for advertisements in the magazine. The premium content targets are loaded from a dataset file retrieved from the Target Manager. A much larger number of targets is retrievable using Cloud Recognition. These could be pages from all regular articles in the magazine. The UDT feature can be used to play a magazine-specific mini-game on a user-defined target. We also show a slightly more advanced use of the cloud recognition API and how to manage the mapping of developer app resources to cloud recognition trackables using a Table. Note: The following snippets do not form a complete application, but help to recreate the use case described above. We load the datasets for premium content and create a dataset for user-defined targets. Initialization of the TargetFinder used for cloud recognition and creating the Table to map content. We update the Table on new TargetSearchResults. Initializing the user-defined targets builder and starting it. 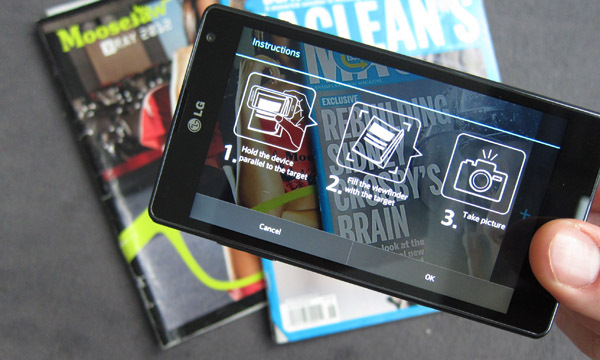 Whenever the user creates a new target on top of the magazine, we create a new trackable and activate it. Rendering our data using our Table to map to content.